(Washington, D.C.) – Citizens Against Government Waste (CAGW) President Tom Schatz issued the following statement following the release of President Donald Trump’s fiscal year (FY) 2020 budget proposals for Major Savings and Reforms. (Washington, D.C.) – Today, Citizens Against Government Waste (CAGW) unveiled its 2019 Pork-Barrel Madness bracket in honor of the NCAA tournament. The bracket features 32 of the worst pork-barrel earmarks of all time. Taxpayers will be able to vote on CAGW’s Twitter account @GovWaste. Voting on the first-round matchups begins today. 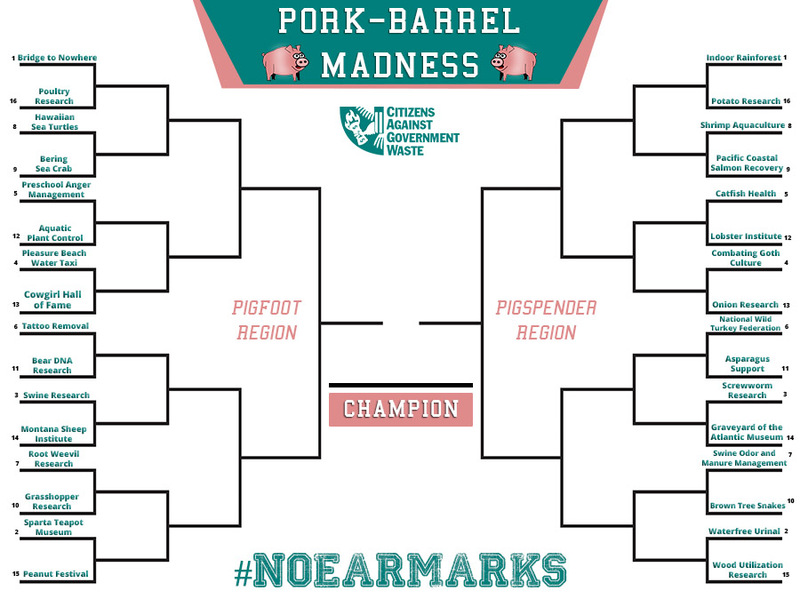 Citizens Against Government Waste (CAGW) presents its 2019 Pork-Barrel Madness bracket in honor of the NCAA tournament. The bracket features 32 of the worst pork-barrel earmarks of all time. Taxpayers will be able to vote on CAGW’s Twitter account @GovWaste. Voting on the first-round matchups begins on March 11 and the torunament will end on April 1. (Washington, D.C.) – Today, Citizens Against Government Waste (CAGW) President Tom Schatz responded to House Transportation Committee Chairman Peter DeFazio (D-Ore.), who announced that he would formally bring back pork-barrel earmarks in order to pass a transportation bill in 2019. (Washington, D.C.) – Today, Citizens Against Government Waste (CAGW) released its Critical Waste Issues for the 116th Congress. The report cuts through the clutter to outline important proposals for smaller and more efficient government. The U.S. Department of Health and Human Services Office of the Inspector General (OIG) admitted last week that the Centers for Medicare and Medicaid Services (CMS) hospital payment process is broken. The OIG’s report, “Significant Vulnerabilities Exist in the Hospital Wage Index System for Medicare Payments,” showed that from 2004 to 2017, CMS overpaid nearly 300 hospitals more than $140 million in taxpayer dollars. (Washington, D.C.) – Today, Citizens Against Government Waste (CAGW) sent letters to 16 federal departments and agencies detailing potential spending cuts that could be made in furtherance of President Trump’s “nickel plan” for an across the board 5 percent budget cut, which he announced on October 17, 2018.